This month we meet the first Gala parkrunner of the month, Intersport visit Lees Road parkrun, Grant Thornton invite us to take part in a corporate 5k challenge, and I reflect on an amazing first few months of 2016. As we approach the end of spring and look forward to summer, it’s a good time to reflect on the post Operation Transformation period and look at how we see parkrun growing over the remainder of 2016. The giddy attendance highs of 9,000 runners, joggers and walkers each weekend during the show have now settled to around a steady 5,000 per week – which is still more than 50% up on the pre-OT figures. We are delighted that so many of these new parkrunners have remained in the parkrun community. We also have lots of new events coming soon with Lough Key, Longford and Ballincollig parkruns scheduled to begin over the next two months. And just as exciting is the expansion of junior parkrun for 4-14 year-olds. Our third junior event is due to start in Albert College Park in Dublin on 5 June. We feel this initiative in particular will grow faster and faster as the year progresses. So if you are a parent and haven’t seen a junior event, we would highly recommend you try to visit one soon. They really are special, and we can guarantee you won’t have ever seen anything quite like it! 2016 has certainly got off to a flying start and we are optimistic that it will be the best year yet for parkrun in Ireland. 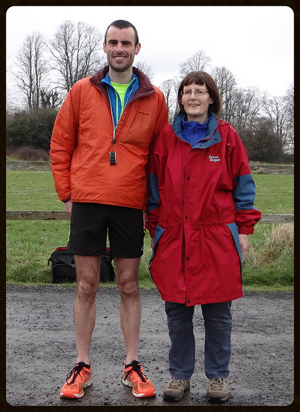 This month saw the launch of the new parkrunner of the month voting app from Gala. parkrunners can submit nominees for the Gala parkrunner of the month by email. A shortlist of nominees is then created and users are able to vote via the Facebook app which goes live during the third week of every month. Voting for the first Gala parkrunner of the month has now closed, with Jamie Ryan becoming the first title holder. 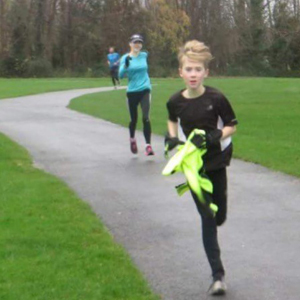 13-year-old Jamie has been participating at Cabinteely parkrun since their first event almost a year ago. Lauded for his positive attitude, Jamie always arrives with a big smile on his face and gives everything to his run. 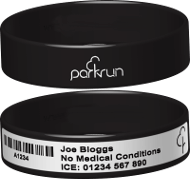 Jamie is a regular volunteer at parkrun events, adopting various roles from photographer to token sorter, marshal to barcode scanner. He is a great multitasker! 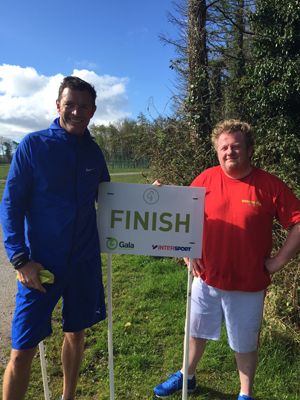 Jamie’s enthusiasm and commitment to parkrun, both as a runner and as a volunteer, perfectly embodies the spirit of parkrun Ireland and he is a very deserving recipient of the first Gala parkrunner of the month award. 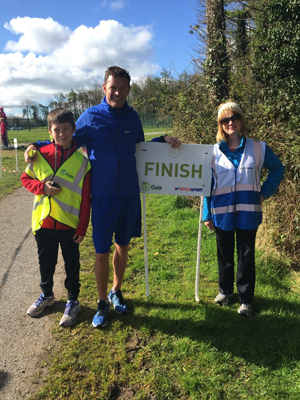 Tom Foley, who heads up Intersport UK and Ireland, joined the Lees Road parkrunners on a glorious sunny Saturday in April, pictured with Run Director Mary and a young volunteer at the finish line. Tom also met Declan who ran his first parkrun that day after completing his couch to 5k programme. We love working with parkrun as we are passionate about helping to make the world a healthier and happier place through physical activity. Running is one of the easiest and most accessible sports, and one that unites people across the nation – so let’s keep parkrun free and help more people, whatever their background, achieve their sporting goals! As partners of parkrun we are great supporters of all sporting achievements within the running community, and there have certainly been plenty of these recently. Our congratulations go to Paul Sinton-Hewitt, founder of parkrun, for completing the Virgin Money London Marathon. As always, we’re here to help with kit and advice about all things running. Pop into your local store for a chat – we’d love to hear what you’re up to. Click here to find your nearest store. Make sure to tag us in your pictures on Twitter@Intersport_UK#loveparkrun and like us on Facebook to keep up with what’s going on. See you at your next parkrun. 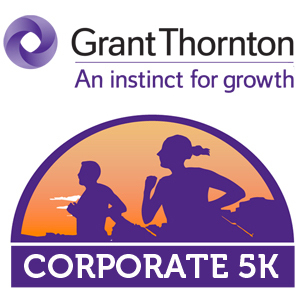 The Grant Thornton Corporate Team Challenge, run in association with Athletics Ireland, is aimed at encouraging social running amongst the business community in Dublin and Cork. Enter as part of a company team of four with three categories available: male, female and mixed. 5k is a great distance for beginners and experienced runners alike, so there is no excuse for you and your colleagues not to give it a try! There will be team prizes for the top five in each category, and all participants will receive a goodie bag and technical t-shirt. In addition, 10% of each entry fee will go to The Alzheimer Society of Ireland to support their work in providing dementia specific services and supports and advocating for the rights and needs of all people living with dementia and their carers. You can check out the event website and register here, and we’re also on Facebook. Has parkrun made a difference in your running if so we would like to share your story? Drop us a short e-mail about your parkrun experience and we will publish a selection each month. No more than 150 words please. Favourite volunteer role: Pacer is a nice one as you get to run as well. Also, I have been known to run and then do the second barcode scanner job. Pre-event set-up also allows you to run as you do the work early and you're finished before the start time of the parkrun. How has parkrun changed your running: Since Castletown parkrun started last year I have become a much more regular (and better) runner. Honestly it gets me out of bed on a Saturday morning! It's just four kilometres away from my house so I can cycle or jog to the start line. What do you like about parkrun: The friendly/community atmosphere is great! Also, the 5k format of parkruns is very versatile. You can run them hard if you feel good, or you can treat them as a training run at a steady pace if you want. Running or jogging before/after the 5k can get your distance up if you want to log some mileage. The use of Castletown House, which is the location for Castletown parkrun, is wonderful. It allows us to run on the trails and paths around the river and trees in the grounds of Castletown House. It's a beautiful place to run a parkrun. Some other amazing locations I've come across through parkrun are Waterstown Park, Dublin and Kilkenny Castle – all great places for a run. Most memorable or funniest parkrun moment: Doing the Saturday 26 December (St Stephen's Day) parkrun in Griffeen last year was a good one. Firstly I jogged over to Griffeen Park but I was a bit late so I missed the official start of the parkrun. My heart started pumping a bit harder when I could see all the runners moving already in front of me. So I had to quickly drop my coat and bag at the start and then run a bit faster than normal. The GPS watch I got for Christmas the day before told me I had ran my fastest 5k and 10k that morning – and the records stood for a few months after that. So the adrenaline from being late produced a good parkrun for me. After I caught my breath I met up with some friends and people I knew from Castletown parkrun so it was nice. I find that the parkruns around Christmas and New Year have a bit of carnival atmosphere as everyone is in good spirits.